Yes indeed, two months after I hit my mid-thirties, Big Sis has finally pulled her finger out and posted my present. 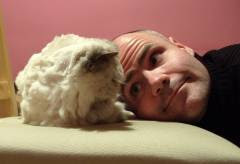 She'd already sent me a photo of it of course, but I'm pleased to say that in the flesh it looks even better. I can't believe I thought it was worthless. Its real value must be ten times that. 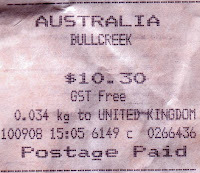 Interestingly, the postmark on the parcel reveals that my gift was mailed in Bullcreek, which is like Wolf Creek, only rubbish. According to Wikipedia, "The name Bull Creek is also often, but incorrectly, written as the single word 'Bullcreek'". Someone should tell the Australian post office. Anyhoo, to describe my gift in the words of Big Sis, "IT IS A NEMO!!!!! Not just any plastic fish". It also has a Patent Pending sticker on the bottom, which seems a bit optimistic if you ask me. I can't see people queuing up to copy it. 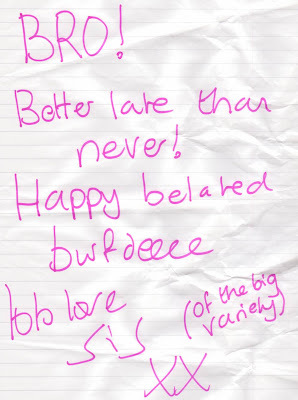 But it's lovely, so thanks Sis, I'll treasure it.